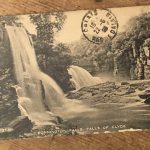 I just wanted to write a short blog to sum up the Romance of the Falls exhibition. When I started this project I bought a postcard on ebay, for £3. Not wanting to promote any one persons work for the group exhibition I needed a strong image for the poster. 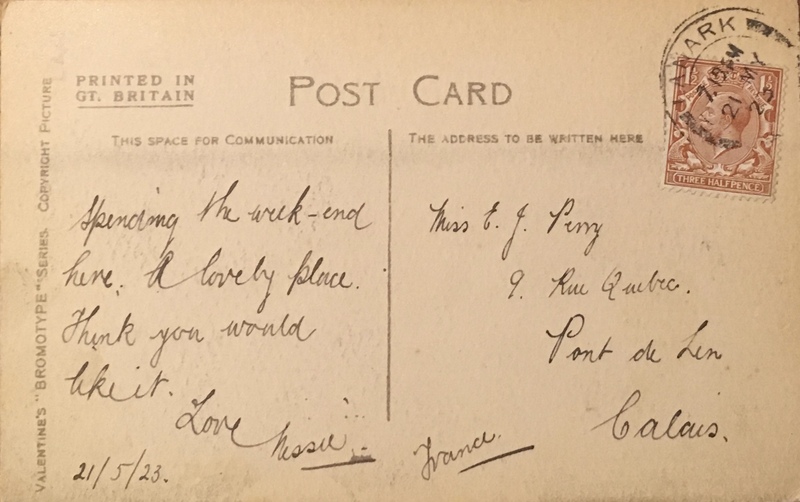 The postcard had been sent from Lanark to Calais in 1923. 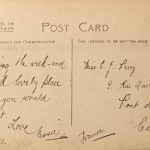 Nearly 100 years later, the postcard became the poster for an exhibition, the Facebook banner, the invitation and was screened on the interactive display on the high street. 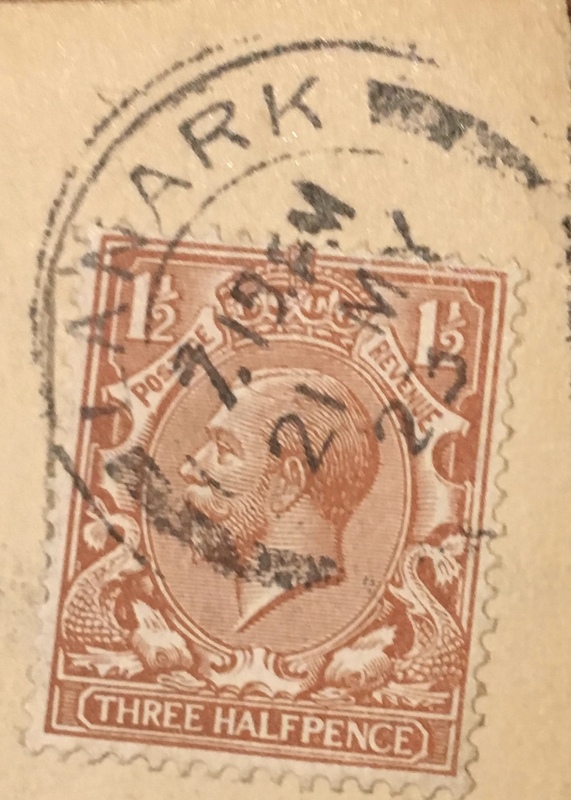 I love that this simple, thoughtful greeting from Lanark was kept all those years and got a whole new lease of life, finding its way back from France to Lanark! 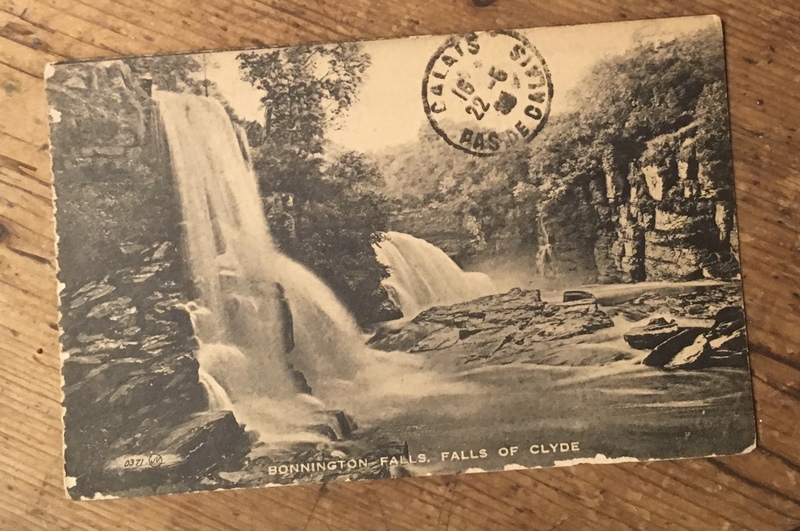 In 1923 Lanark and the Falls of Clyde were still a tourist destination. I challenge you to find a postcard of the Falls for sale in Lanark today! That is because the hydro electric stole the power of the Falls shortly after this card was sent and Lanark as a tourist destination fell into decline. The landscape around the Falls of Clyde is till under threat. For over 200 years visitors, artists, poets and writers flocked to the Falls of Clyde. It would be wonderful to think in 200 years time the same thing is happening. It was a wonderful summer with the falls in full power. I would LOVE to see them like that all the time. I think it would be very good for the area and put Lanark back on the must go map!